Viva la vida - Slovenian fashion and beauty blog : It's all about "bindi"
I'm posting a lot of makeups from my iMac web cam, I know! But it's so simple to take photos with it & light is good & I think it's so personal and cosy! So, about this look! Friday evening, I was going to theatre and I really didn't know what to wear or what makeup to use - so this is all "last minute" look. I decided for totally black outfit, but a little more statement makeup. I used Makeup revolution eyeshadows (baked black) and Mac lipstick Cremesheen party line. I got it from my neighbour from San Diego! 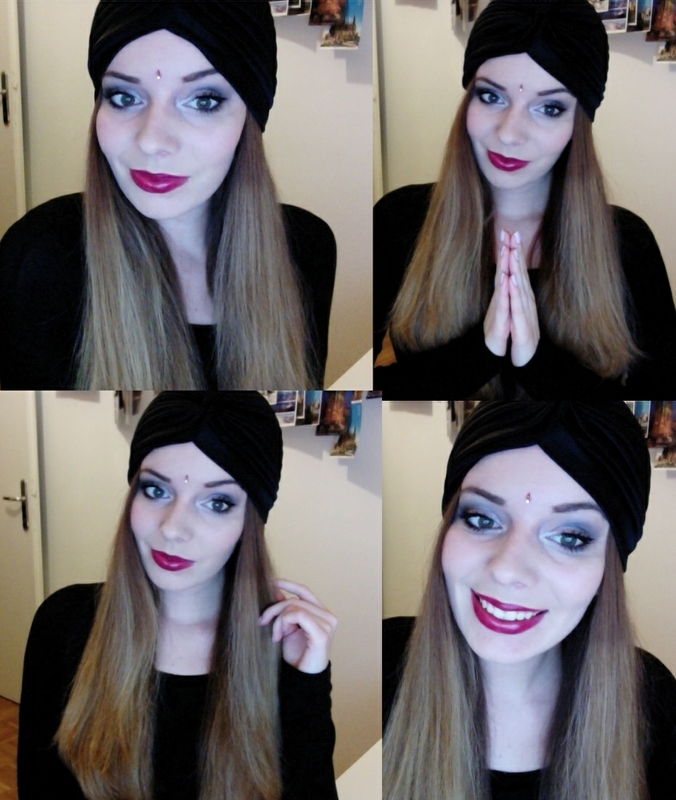 I decided to go for a casual "indian" look, so I wore my black turban & BINDI! Bindi is this shiny glittery sticker I have on my face! I simply love it, it gives a whole makeup a "cherry on top" - thanks to my blogger friend Agnes, I first tried it with her and immediately ordered myself a 100 bindis from Ebay! I really think bindi & turban made a whole look special. So I'm satisfied with the result. Nice lipstick color! Looks great on you! Drugače sem samo sive-črne senčke uporabljala. <33333 you look stunning ! Hey dear! Thank you for your comment on my blog! As you asked, of course I would like to follow each other! I'm following you, hope you follow back!